This beautiful echium begins life as a silvery rosette reminiscent of our native Celmisia. It takes one or two years to flower; if it lives for that long. It can be fickle here in Dunedin and die at any moment. In a flowering year the centre of the plant starts to twist and a tall spike erupts with spirally arranged pinky-red flowers. The stamens are much longer than the petals, giving the plant a wispy look. Once flowering has finished, the whole plant dies, setting plenty of seed for its progeny. 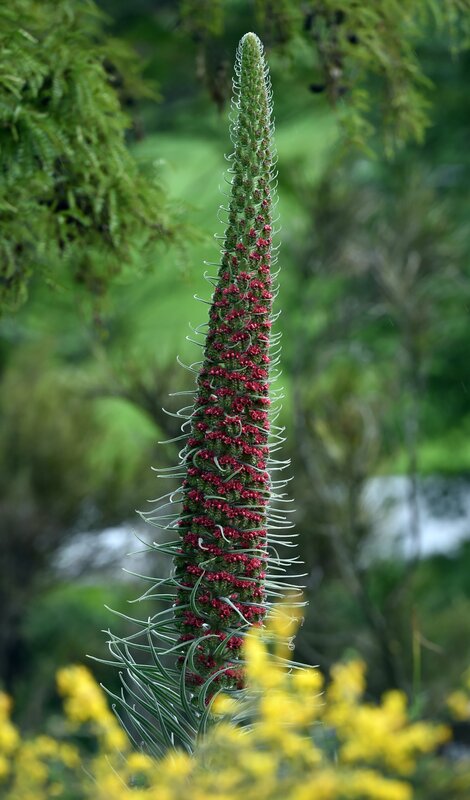 Commonly called tower of jewels or red bugloss, Echium wildpretii is endemic to Spain's Canary Islands, growing in the sub alpine zone of mountain regions on Tenerife. It therefore grows best in full sun in a well-drained soil and does not like extreme frost. Gloves should be worn when handling as it is covered in fine prickly hairs. One could be forgiven for thinking that the plant was so named because it looks wild and pretty in its natural habitat. It is however the namesake of the 19th-century Swiss botanist Hermann Wildpret who was head gardener at the botanic garden at Oratava in Tenerife for many years. He discovered and described many Tenerife native plants and played a part in their conservation by exporting seed to other countries. Red bugloss is looking splendid at present at the northern end of the rock garden at Dunedin Botanic Garden.